I am trying hard this year to focus on buying a few pieces each month for my wardrobe that are really special and that I am head over heels in love with instead of a bunch of stuff that is sort of generic and like everything else I own. A couple months ago this "flag stripe" skirt was one of the above mentioned "special" purchases and has since become one of my favorite skirts, which is saying a lot because I have a trove of skirts in my collection. 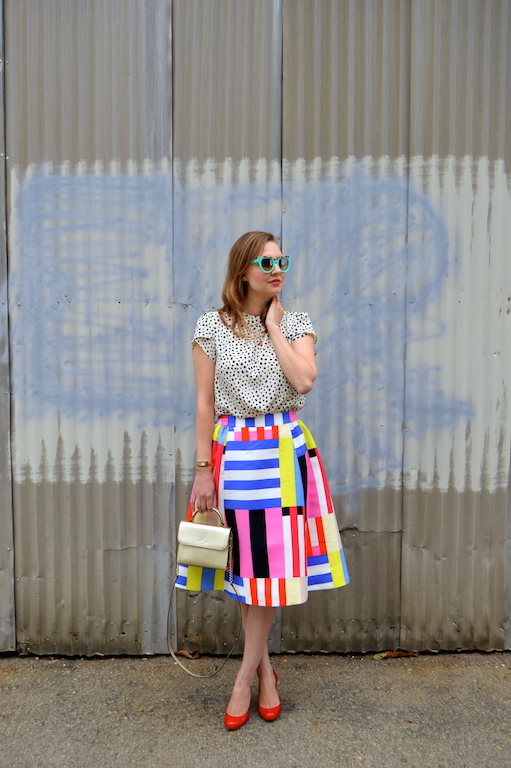 A month or so ago I featured this skirt on my blog in a post entitled Attack of the Giant Dots, which, like the skirt, proved to be one of my favorite posts of the year. Since the skirt is one of my favorite purchases, I wanted to find a way to feature it again on my blog. 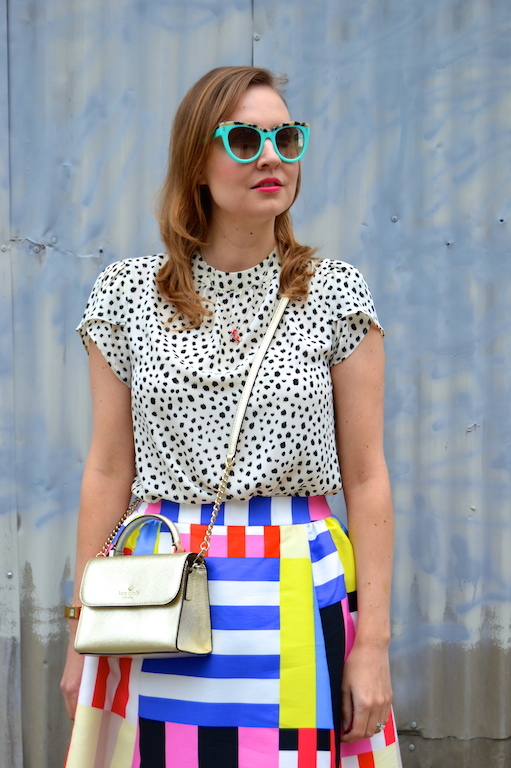 I found inspiration from another blogger who paired the skirt a dotted blouse. Loving the mash-up of stripes and dots, I created my own interpretation, which you will see below. Stripes and dots are obviously some of my favorite patterns, so naturally it would make sense to throw them together. Since the stripes are very large and the dots small, the pairing seems to work. I also added my own touches to this inspired look with the addition of a gold handbag and my new favorite Stella McCartney sunglasses in a vibrant hue of turquoise. 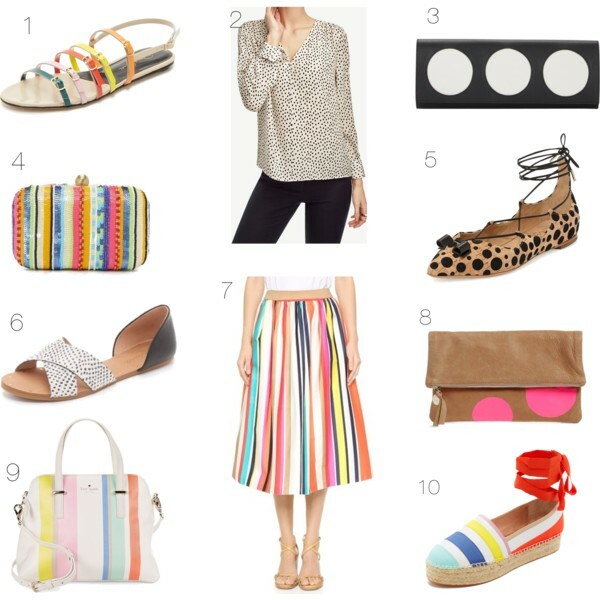 Since my look above is inspired by others, I am offering some of my favorite items for spring that are all inspired by my own look of stripes and dots. Below you will see some selections for spring of colorful stripes and dots, both big and small. This skirt is so so fabulous and fun and unique! I love it paired with the dots. The whole outfit makes me smile!! I love how this print mix turned out! Stripes and dots are always so fun together, so I love all your picks as well. Smart idea to only add a few pieces that really feel like you each month--I think that's do-able when you have lots of go-to items to build on. I sometimes tend to buy too many "basics" and not enough "fun" items, but I'm trying to be better about that! The skirt has been a really good purchase! One of those pieces you will wear for long...useless to say that it looks gorgeous on you!! Wow! That skirt is super fun! I love the vibrant color paired with the bold print! I swear you are the best at putting together patterns! Absolutely adore this! I like your shopping statement of buying what you love and this skirt was a great one to get at that. I love all of your colors and mix of prints each post, so adorable. Do come by and linkup with me this Thursday and every Thursday. I would love to have you in my linkup and for you to share your style thoughts with my readers. =) Thank you. Ada. I am swooning over the bright colors!!!! I love your pattern mix, it looks stunning on you. Hope to see you at my linkup today! 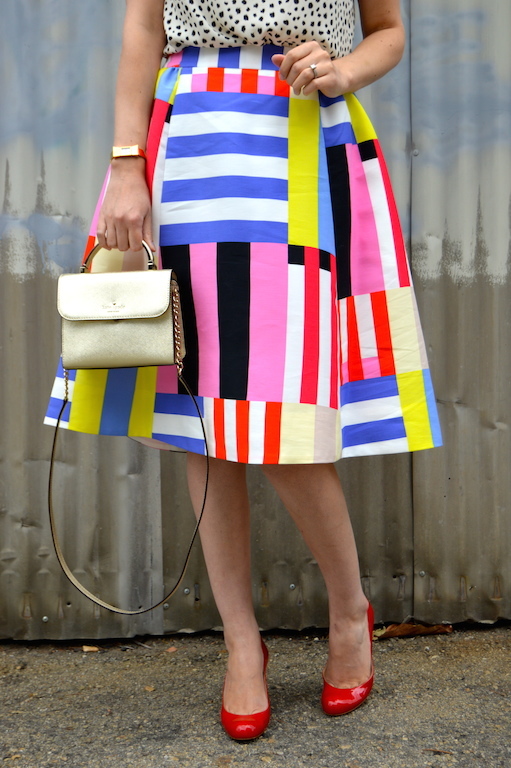 Great pattern mixing, and love all of the colors in your skirt. I love color too Katie and I know you have fun with fashion! Polka dots look great!